Stone wool tile with good acoustic properties. Tile depth = 15mm. Tegular edge = tile face drops down beneath the grid. Compatible with 24mm wide grid only. Free shipping over £400.00! Rockfon Chicago Metallic T24 Click 2890 suspended ceiling 600mm cross tee in white. Click connection. Box of 45 lengths. 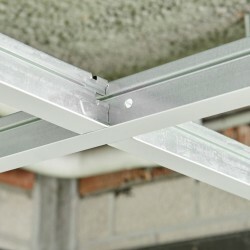 Rockfon Chicago Metallic T24 Click 2890 suspended ceiling 1200mm cross tee in white. Click connection. Box of 45 lengths. Rockfon Chicago Metallic T24 Click 2890 suspended ceiling main runner in white. Click / hook connection. Box of 15 lengths. 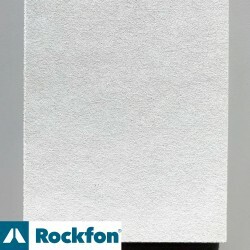 Rockfon Chicago metallic perimeter wall angle trim 32x19x3050mm in white. Box of 40 lengths. 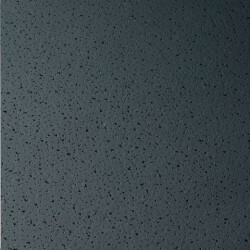 This black ceiling tile is available as 600x600mm and with a board square edge finish giving a flush surface with the grid. Perfect for cinema rooms, cafes, restaurants, bars or nightclubs. Free shipping on orders over £400.00!